Themes can come in many shapes and sizes. They can be elaborate and over the top, or they can be paired down and simple. Check out some of these theme inspirations and discuss them with your personal chef for your next at home party. A classic way to give focus to a party is by choosing an ethnic theme. Italian, French, Mediterranean, Asian- the options are endless. Decorations can be basic in this theme and will be simple to arrange in the style of the ethnic cuisine you choose. Many personal chefs have cuisine specialties, enquire about this when you hire a personal chef. Out of the ordinary holidays are always an interesting party theme. There is always a lot to play with as far as drinks and food, as well as decoration. A unique idea would be to choose a holiday that was featured in a film or television show, but doesn’t really exist, or is pretty obscure. Guests will be sure to find this amusing, giving great fuel to the dinner conversation fire. And speaking or movies, or books, even, why not throw a book or movie themed dinner party? This theme gives great opportunity for an interesting menu and cocktail selection and will definitively have your guests talking. Bygone eras always make for great dinner party themes. Think of throwing a 1920’s style party, all the rage since the return of The Great Gatsby. Speakeasy style is another fun dinner theme that fits into the 1020’s era. Options are huge on historical inner party themes, so be sure to speak with your personal chef when you are planning a theme like this. They are sure to have some great ideas and inspirations for you. Don’t feel like you have to go all out with an elaborate theme to pull a party together. 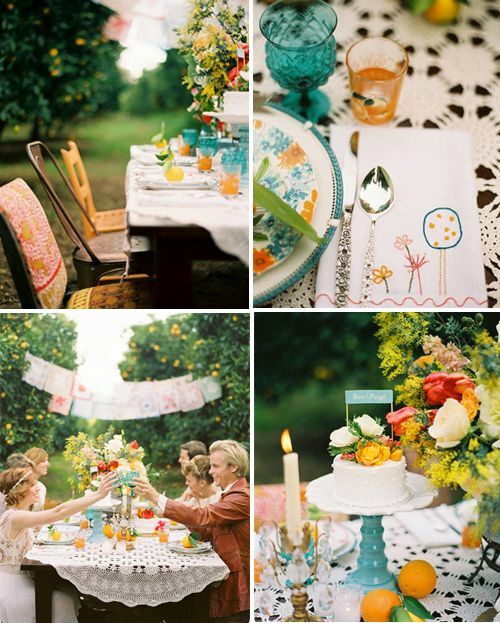 Something as simple as a colour theme can bring gorgeous elements to a dinner party. Table linens, glass ware, table service, and food selection can all tie into a colour theme to create a dinner party with amazing ambiance. Going green has never been more popular than it is today. Theme your party around this trend and you can be sure that your guests will be excited. Consider hiring a chef that has an expertise in farm to table cooking. Catering your dinner party around a specific type of food is also a very popular way to incorporate a theme. Think tacos, pizza, BBQ-you name it; you can create a whole party around it. These themed party ideas should get you started on your way to throwing a memorable and talked about event. And remember, big or small, simple or elaborate, themes will always tie a party together and bring guests together with something to talk about.